Food is a basic necessity of life, and sharing a meal with others is one of the most effective bridges to relationship building. Our Healthy Meals Program is offered to every woman without questions or requirement. We serve healthy, hearty breakfasts and lunches, Monday through Saturday that improve the physical health and emotional well-being of our guests. Breakfast at Women’s Lunch Place is always freshly prepared, nutritious, and delicious and served restaurant style by volunteers at 8 am. For guests needing more sustenance, there is an “all you want” selection with choices of hot cereal, yogurt and fruit until 10 am. Whole grain bread, peanut butter, milk, coffee, juice, and tea are available throughout the day. Women stop in to the shelter for breakfast on their way to work. Others staying in shelters or on the streets, are waiting for us when we open at 7 am. They are grateful for a hot shower, bed to nap, hearty meal and the company of other women experiencing poverty or homelessness. Lunch consists of high-quality, freshly-prepared dishes of grains, meat or fish, salad, fresh vegetables, fruit, and dessert. Menus are planned to emphasize nutritional content and diversity. Food preferences are accommodated, and vegetarian alternatives are available at every meal. Our guests sit together at tables with fresh flowers and lunch is served restaurant style on china plates with flatware. Lunch is more than a meal; it is integral to our efforts to treat every woman in a trauma-informed model of care. Staff and volunteers treat every woman so to minimize the trauma that can accompany food insecurity. 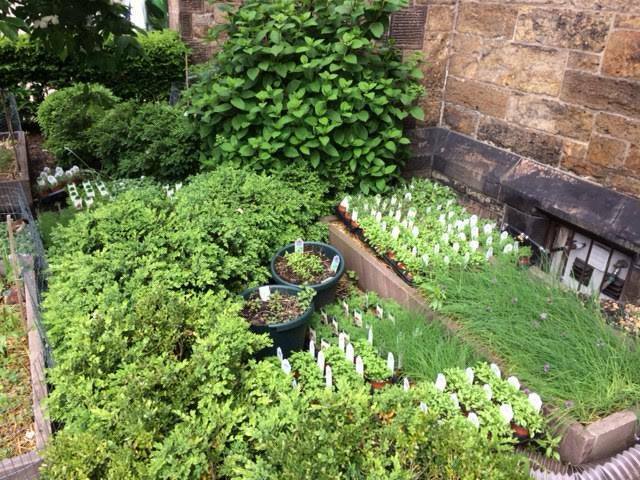 Ellen Abdow, owner and proprietor of Perennial Gardens and long-time volunteer at WLP, built the herb garden on the grounds on Newbury Street. Each spring we plant herbs in the raised beds that are harvested throughout the summer and fall to add fresh flavor and nutrients to the meals. Volunteers and guests help to keep the garden pruned and see firsthand the benefits of “from farm to table”! Sponsor a breakfast or lunch at the Women's Lunch Place to honor or remember a loved one at any time of year. These are thoughtful gifts for birthdays, memorials, or just to thank a friend, and they provide nutritious, healthy meals for up to 225 women a day.